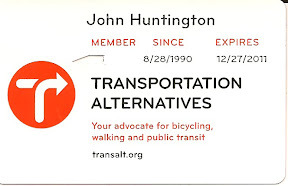 I moved to NYC in 1990, and as a cyclist, pedestrian, transit rider and motorist, I also joined the advocacy group Transportation Alternatives that year. But, after 21 years, and donating over a thousand dollars to the group, I just resigned. TA has come out in support of the FDNY's stupid plan to charge motorists for medical treatment after accidents. I had a long email exchange with TA's Deputy Director Noah Budnick on the issue, asking him to cite any actual evidence to support TA's statement in the Gothamist link above, "if the consequences of risking life and limb are not enough to spur motorists to drive safely, then the cost of their wallet may be an even stronger incentive". In the exchange, Budnick cited study after study supporting policies that I agree with (congestion pricing, etc), but failed to offer any evidence that charging motorists for medical treatment after accidents would increase safety for anyone in any way. In addition, regarding TA's statement, "Automobile crashes are ... not 'accidents.' ", Budnick had no response to my own personal example of being in a serious crash (as a passenger) on the GW Bridge after the bridge surface iced over suddenly. The driver was not speeding or driving erratically, and yet we totaled the car. It was an accident. The final straw was when I asked Budnick why the policy should not apply to cyclists who hit and injured pedestrians. He didn't really have an answer--he just said that cycling is good, and that adding cost to cyclists would discourage cycling. That's just a ridiculously inconsistent position, devoid of logic or fairness. To be clear, I support many initiatives to encourage cycling, and I'm a big fan of NYC Transportation Commissioner Janette Sadik-Khan's work. And for the last 21 years, it seemed to me that TA was the voice of reason, the group that worked with City Hall, while Time's Up! and others took extremist positions and fought "the man". But it seems to me that TA is now guided by ideology rather than facts and sound policy, so I have resigned and asked for a refund of my donation for this year.